The following is an updated pie review, superseding the review of the Sainsbury's Chicken and White Wine Puff Pastry Pie in March 2012. 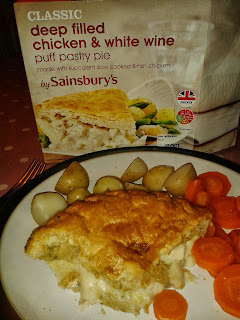 You may recall that when I went to review the Sainsbury's Deep Fill Chicken and White Wine Puff Pastry Pie a couple of weeks ago I found out that we had already reviewed the Sainsbury’s Chicken and White Wine Puff Pastry Pie back in March 2012. Don’t worry – I’m not going mad and reviewing the same pie again. Did you spot it? Sainsbury’s have added “Deep Fill” to their box. But was there seriously any difference? Or have I been duped by their marketing gimmicks. Looking at the photos of the two pies, the box and the depth of the actual pie I ate compared to what I remember of it before, I was not convinced. However, after waiting a week for a reply from Sainsbury’s I finally heard back on twitter that there were some differences between the pies. 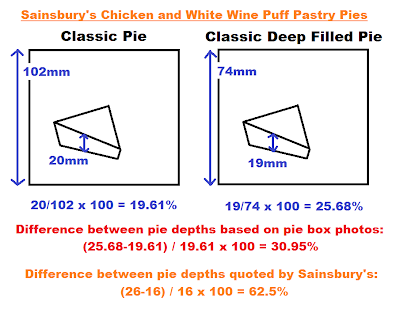 Frustratingly, @Sainsburys have since deleted these comments, so I cannot show you them, but in essence they told me that the old pie was 16mm deep, but the new pie was 26mm deep, and that the chicken had been cooked for longer in the new pie to be more tender. In summary, with the original non-deep fill pie reviewed in March 2012 no longer in production, and as the supplier is different and the pie is a different depth, it warranted an updated review. However before I assess the pie, a quick comment on the information supplied by Sainsbury’s. Unfortunately as I no longer have the two pies to eat and re-measure at this point, I have had to use the secondary resource of the pie photos. The boxes should accurately reflect the pies in question and with a near identical style photo on the box, I used the ratio of the measurements of the depth of pie to the average middle pie depth and do not believe that the 62.5% deeper analysis (16mm to 26mm) is accurate, even if the pie is a bit deeper. The million dollar question is how deep does a pie need to be to be labelled “deep fill”? 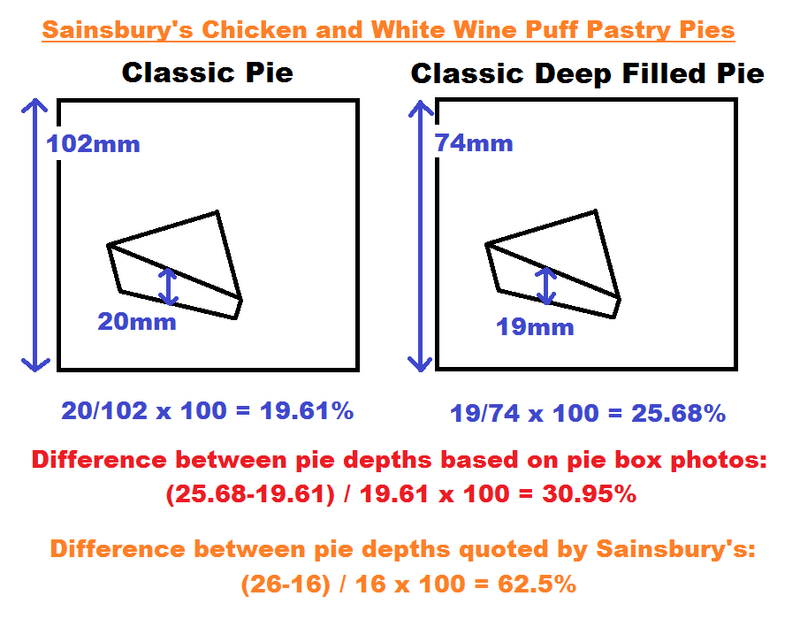 In my opinion the difference between these pies in reality (as opposed to the data above based on the box photo) indicates next to no actual difference in depth (especially not 62.5% difference as quoted). 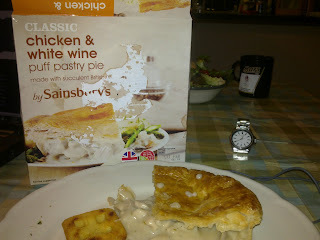 Onto the actual taste and the pie itself was a nice one, with the white wine sauce of the Sainsbury’s pie being very nice. It really complemented the puff pastry well, and in conjunction with the light, golden puff pastry it was a real winner. The pastry was nicely golden and in great condition, with the capacity being good and the pieces of chicken very tasty. However I couldn’t help but think that for a pie labelled as “deep fill”, this certainly didn’t strike me as any more filled than a standard pie I’ve had. The filling was good but both my hosts the Senei and I felt the filling to pastry ratio was a bit disappointing, especially when the supposed deep fill should alleviate this and improve the ratio. All in all, I would eat this pie again but it certainly was disappointing to see so little difference (if any) in the two pies considering the new supplier was supposed to be providing a “deep fill” pie. See where the pie ended up in the Pierate Pie Rankings or find other pies of a similar flavour. How Do The Pies Square Up? Stick that Ember Inn your pie and smoke it! The Mother of all pies? Why Can't All Pies Be Paul's Pies?